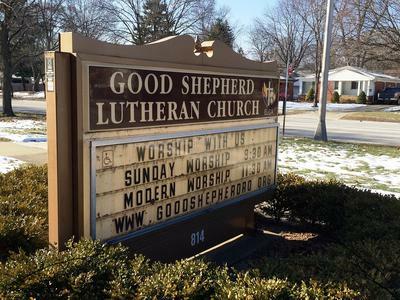 Visitor Question: Background: Our church council president recently went before the city planning commission to ask for 3 variances for a new LED messaging sign. The commission granted the first two, which only had to do with the sign being 7" bigger than allowed, and placement on church property, but they denied the 3rd variance from a zoning ordinance provision that said no messaging signs are allowed in the zone. When we applied for this sign, these types of signs were allowed, but then there was a 1 1/2 year moratorium on LED signs. After it was over, our church was rezoned to a zone where these are prohibited. We feel we should have been grandfathered in due to the timeline, and that this is unfair, and a "staged" response, as they gave us the first 2 variances with little thought, yet denied the one where we actually can get the sign, making the first 2 a mute point. In addition to this, at the meeting, there was a company that spoke before us, stating they wanted to turn an old warehouse into a business, and they were heartily welcomed and granted their wishes by this commission. Right after that, we were denied. All voted no with the exception of our Mayor, who needs re-election soon. We feel a direct bias and/or prejudice because their business would ultimately be paying taxes to the city, whereas our church is a 501(c)3 non-profit. Our church is 67 years old and needs an updated sign to get in touch with today's technology, with emphasis on increasing membership. Question: How do we fight this denied variance - should we hire a lawyer, and if so what type? Land Use? This would be last resort, as we are have limited funds. I have already written to this mayor asking him to reconsider, should I be writing also to our Governor? I don't know who oversees the city commission, but many are saying they are judging beyond their job descriptions. Editors Reply: Let's take the many questions one by one. First, should you have been grandfathered in due to the the fact that this sign was legal when you applied for the variance? The answer is "possibly." That would depend on the exact language in your zoning ordinance and also in the ordinance that imposed the moratorium. Case law (interpretations of the law made by the courts) may address the circumstances under which moratoria may be imposed in your state or region. If you want to argue that you should have been grandfathered, yes, you will need an attorney. Hire someone who has practiced land use law (or at least municipal law) in your area, not your daughter's divorce lawyer. If you want to assert that the rezoning itself was inappropriate, you also need a land use attorney. The second implicit question is whether the commission was showing bias against your church because you are not paying property taxes. While anything is possible in a particular location, we doubt it. We haven't ever heard informal discussion along these lines during our many years of collective experience in staffing zoning commissions and zoning boards of appeals. If indeed it was a planning commission, your local zoning ordinance might provide for appeals to the city council. If so, prepare your best reasoning and follow the procedures to mount that appeal. If it was a zoning board of adjustment or board of zoning appeals, or some such combination of words, probably your only appeal is to a court. This is costly, and you would need an attorney for sure. An attorney could advise you of the likelihood of success of such an appeal. You ask if you should write to the governor. Our answer is no. Nowhere in the U.S. is a governor or state legislature empowered to interfere with or override local land use decisions. Our opinion is that your best course of action would be to prepare a careful argument about why an LED sign in your current zoning district would not be a nuisance to neighboring property owners, and would not jeopardize health, safety, and general welfare in any way. Then ask your city planning commission to change the district regulations to allow these newer LED signs. This has the advantage of not costing anything except your time in pursuing a political solution.